When I saw this dress on the Hope's website, I immediately became obsessed! When it comes to the colder months, leopard print is a neutral in my closet, and I am always looking for any excuse to wear it year-round. So when I saw this dress, my animal-print loving heart sang! Although this dress is perfect for summer, I am still craving fall. I added booties to this outfit to show a more transitional look, but this dress would look adorable with a pair of Tory Burch sandals, or of course, my favorite wedges! This dress is ADORABLE!!! Perfect and can transition to summer well! That dress is so fun! Love the print and I love the booties as well! Beautiful look!!! :) Leopard is my favorite right now! Oh my goodness! This dress is major GOALS! You look beautiful as always! This is my favorite look! I love this dress..it may need to make it's way into my closet! lol. This dress is adorable! Looks great on you. The colors in this dress are amazing! Love the fun colors in that dress! 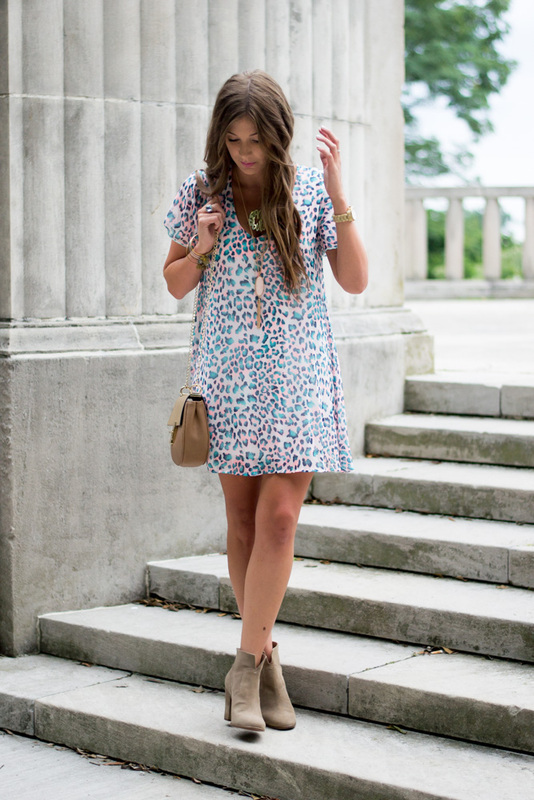 Love this leopard dress! You look stunning! Stunning dress! I love the fall touch the booties add to it. But the colors are gorgeous! I am guilty of only wearing leopard in the Fall and Winter. I love that this dress made it summer-able!!! It looks amazing on you! !